What Is a Pergola and How Does It Differ From an Arbor? How Is It Different From an Arbor? A pergola is an outdoor structure consisting of columns that support a roofing grid of beams and rafters. This roofing grid may be left open or covered so as to create an area sheltered from the elements. Pergolas may be freestanding or attached to a house. Are relatively simple structures, lacking architectural flourishes such as masonry columns. Frequently bear curved arches at the top. Are increasingly being made from vinyl, rather than more traditional materials. Are freestanding (that is, they are not attached to houses, although they may be attached to a fence, in which case they sometimes house a gate). Pergolas, by contrast, are typically larger structures, often in every dimension (height, width, and length). Sometimes given greater architectural treatment, they may exhibit masonry columns, for instance. Their tops are more often flat. Traditional pergola design harks back to grand masonry pergolas of the Italian Renaissance. But the term, "pergola" is used more loosely now, and includes wooden structures (as in the photo). Pergolas are often attached to houses, such that they form an outdoor living space that essentially serves as an extension of a home's indoor rooms. In answering the question, What is a pergola? some experts would distinguish pergolas from arbors by noting that the columns of the former form something of a "colonnade." For instance, Landscape Architect, Cynthia Cash writes, "The primary difference in an 'arbor' and a 'pergola' is that an arbor is a free-standing structure (also used to support vines), whereas a pergola is a long linear structure over a garden pathway." 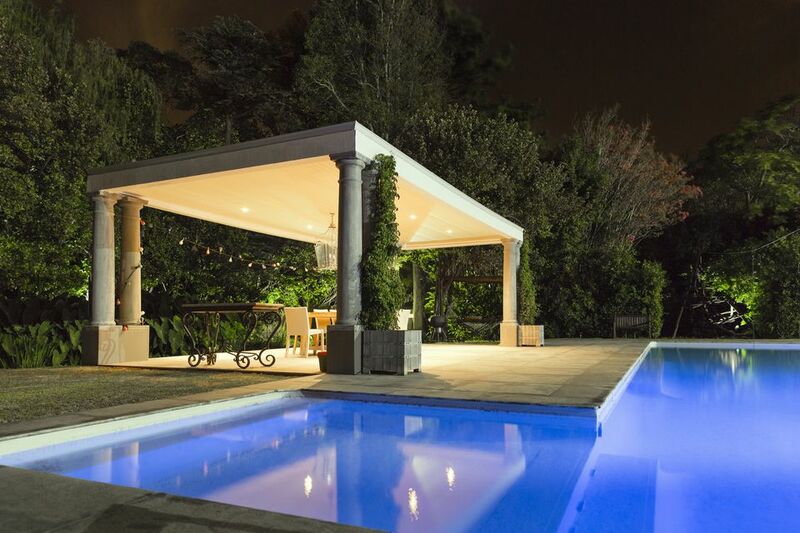 How Are Gazebos and Carports Different From Pergolas? A "carport" is a structure defined more by its purpose than by how it is made. Carports are used to shelter one's automobile at home in lieu of the more expensive option: a garage. The basic carport is a roof supported by posts. But I have seen more elaborate carports that are essentially pergolas co-opted for car storage. Pergolas, arbors, trellises, and latticework have all been traditionally used to support vines. A trellis is a portable framework meant to support such plants as vines and climbing rose bushes. It can be made of wood, metal, or vinyl. There is overlap between the words, "trellis" and "lattice," but the design of the latter is more specifically associated with a crisscross pattern or a checkerboard pattern. Latticework is often tacked to the sides of an arbor or pergola to give vines something to climb up. But to afford complete shade, plus protection from rain, some people cover their pergolas. One sometimes sees fiberglass used as a covering, but the more upscale homeowners may be interested in retractable shade canopies. What Are the Best Wooden Structures for Your Backyard? Outdoor Room Construction: What's in It for You? What Does It Mean to "Buck Up" Logs?